Adamsdown was originally farmland – the building by Adamsdown School, formerly the Great Eastern Pub, is an old manor house which later served as a farmhouse. The area off Constellation Street now known as Anderson Fields was once the site of an abattoir and cattle market. The East Moors steelworks used to stand on the other side of the railway and many Adamsdown residents worked there, crossing the footbridge from Kames Place historically known as the ‘black bridge’. Fred Keenor fought at the Somme and was later captain of Cardiff City when they won the FA Cup in 1927. A renowned battler, he was educated at Stacey Primary (as was Mastermind presenter John Humphrys, who doesn’t get a mention!). 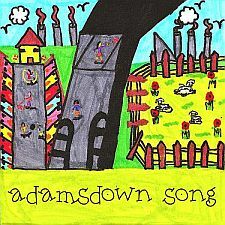 The chorus (in case anyone hasn’t noticed) is based on the street names of Adamsdown. As many of these streets were built in the 1860s, their history goes back more than a hundred years, so that last line employs poetic licence! “Mucky Park” is the historic nickname for Adamsdown Square, where the original Adamsdown primary school once stood. slight mistake. Mucky is not where Adamsdown school stood. it stood where block of flats is that over look the park. I went to Adamsdown school in the 70’s and we used to play in the park after school. the reason it was called mucky park is because it was always muddy because hardly any grass grew because the whole park was in the shade of the huge trees. lovely and cool in summer though. Strictly speaking you’re right, Eva!